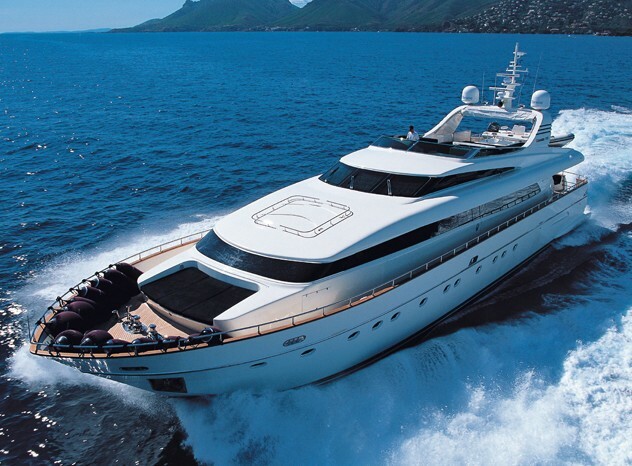 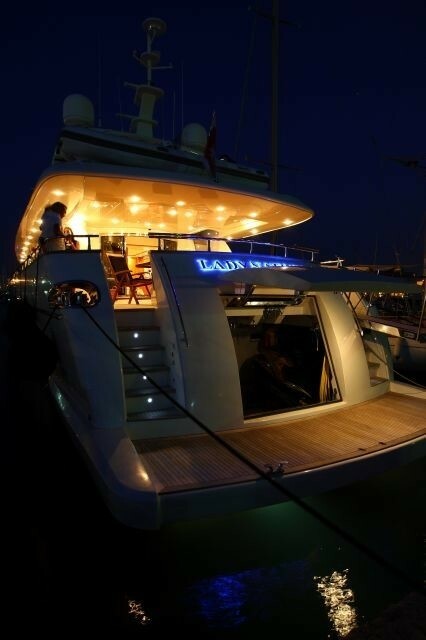 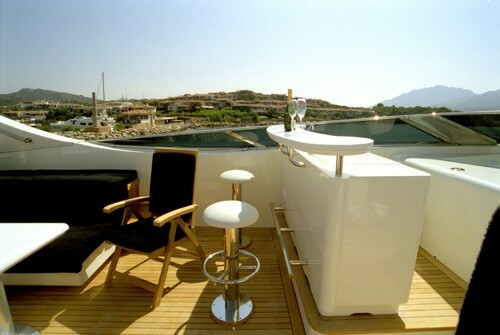 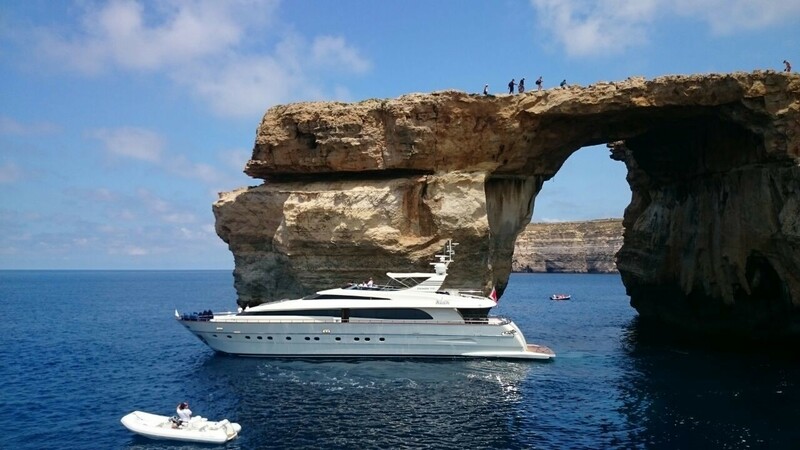 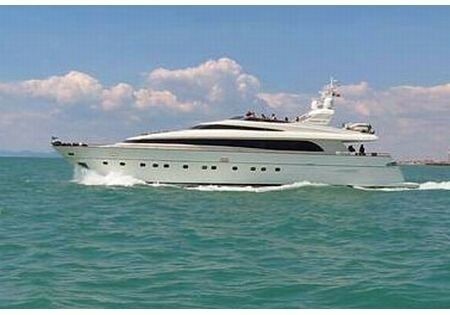 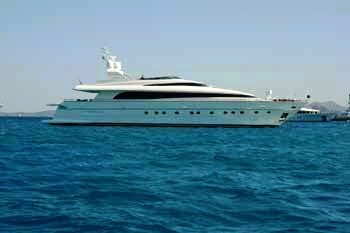 The Luxury Motor Yacht LAYAZULA (ex LADY NATINIA) was launched in 2004 and became an immediate success. 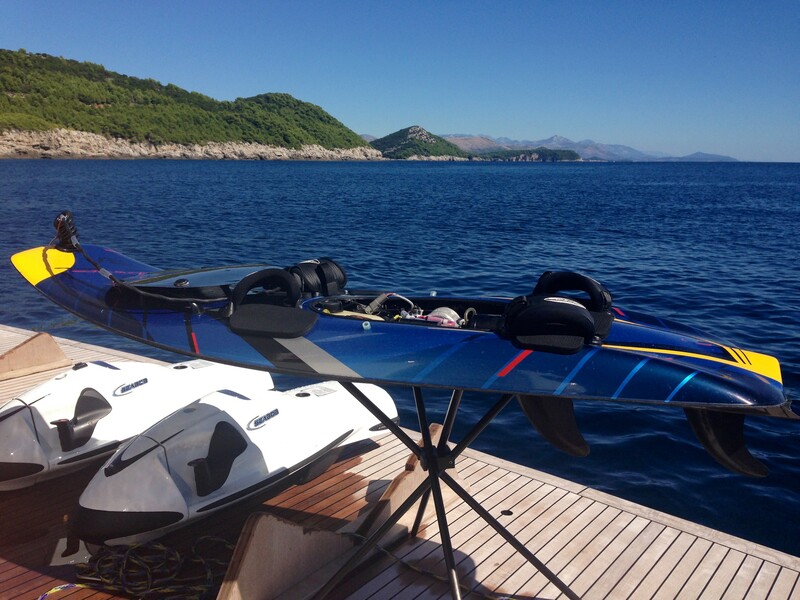 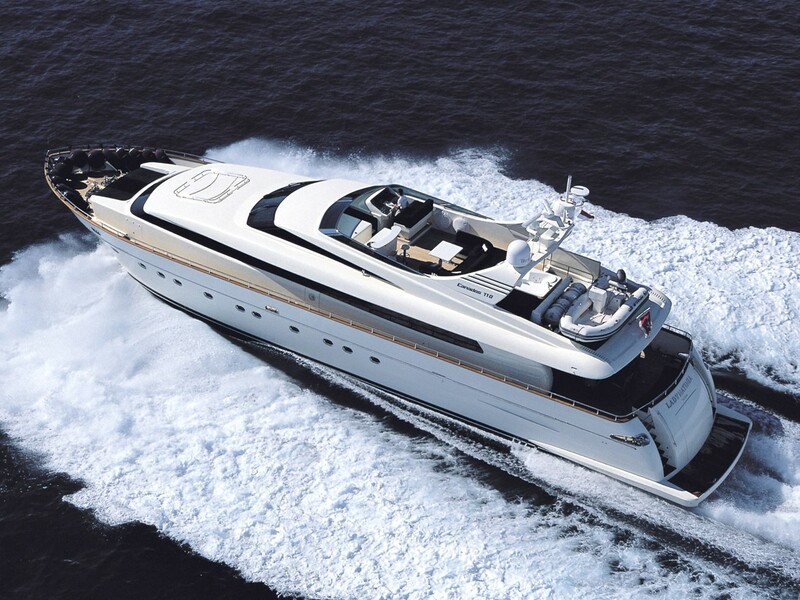 Her sleek lines are matched by impressive performance, capable of speeds approaching 30 knots. 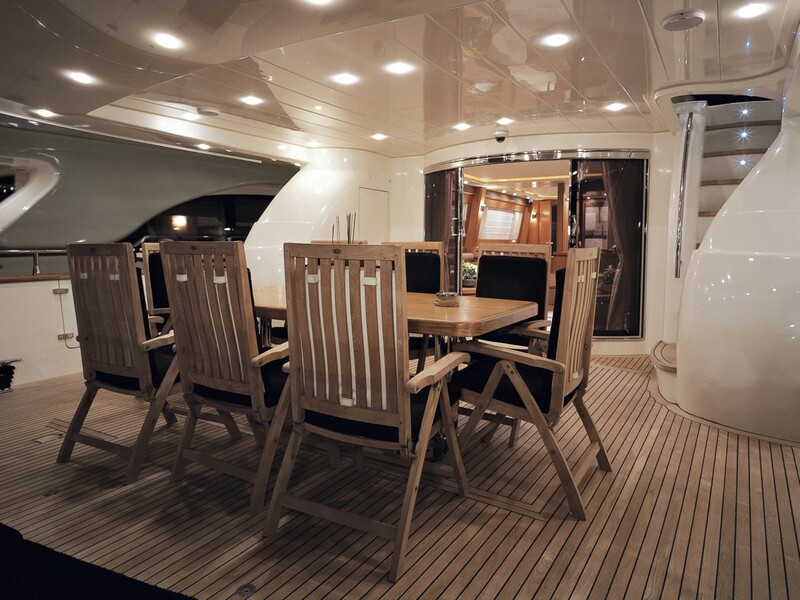 LAYAZULA’s interior is thoughtfully laid out with a sociable open plan saloon incorporating a dining area forward. 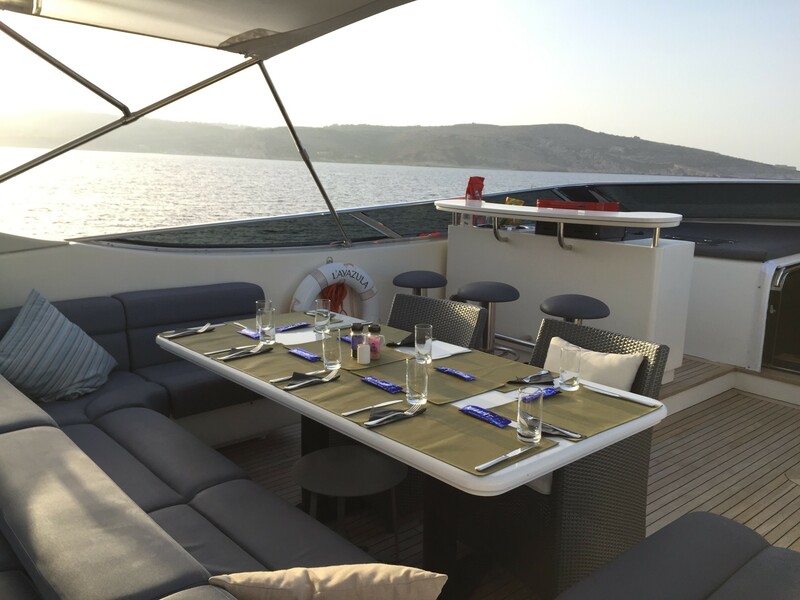 She is equipped with the very latest in entertainment systems including DVD players, plasma televisions and surround sound home cinema system. 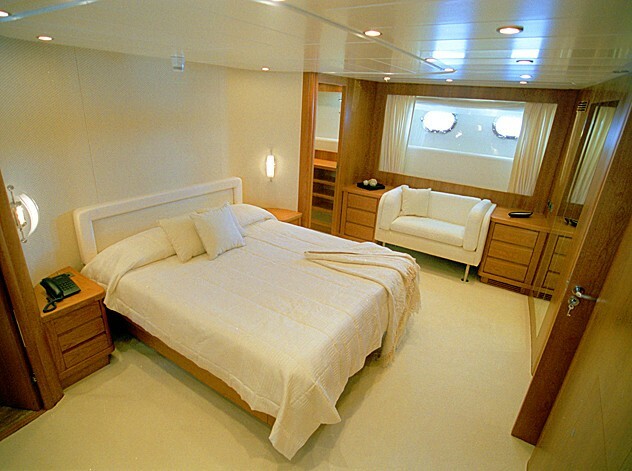 LAYAZULA’s excellent facilities even extend to a well-equipped gymnasium on the lower deck and a relaxing spa pool tub on the upper deck. 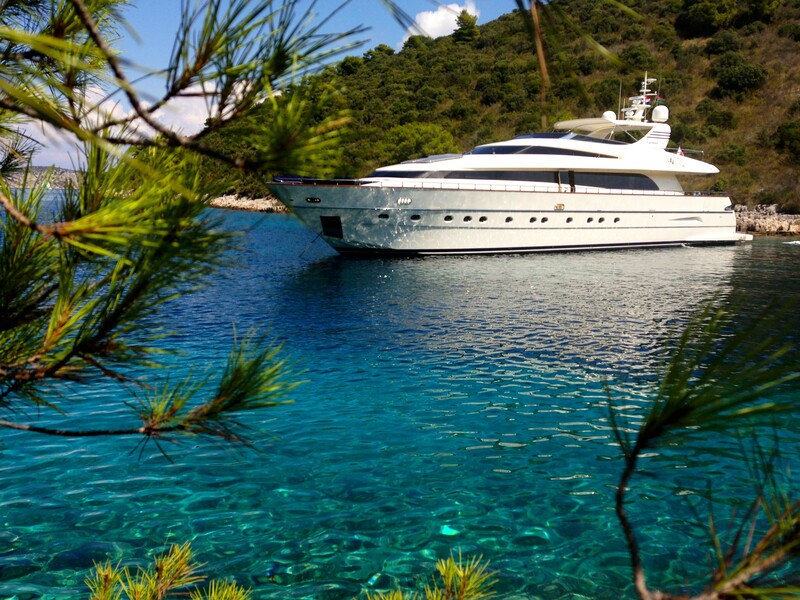 M/Y LAYAZULA is designed to make the most of outdoor living. 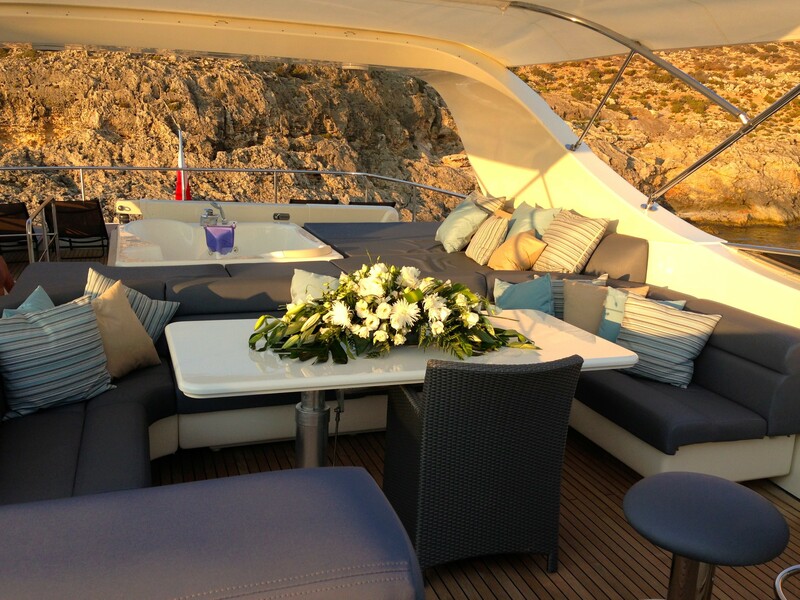 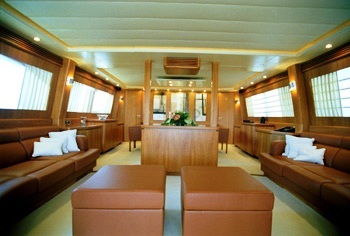 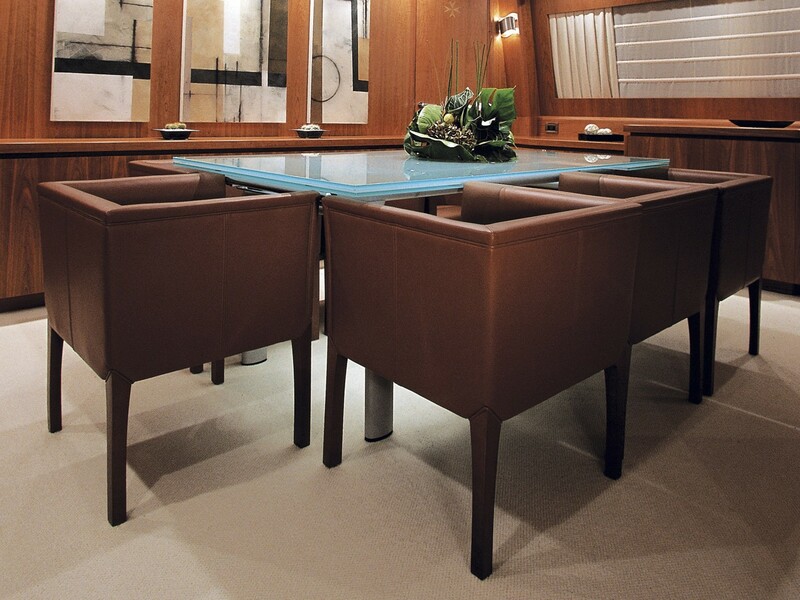 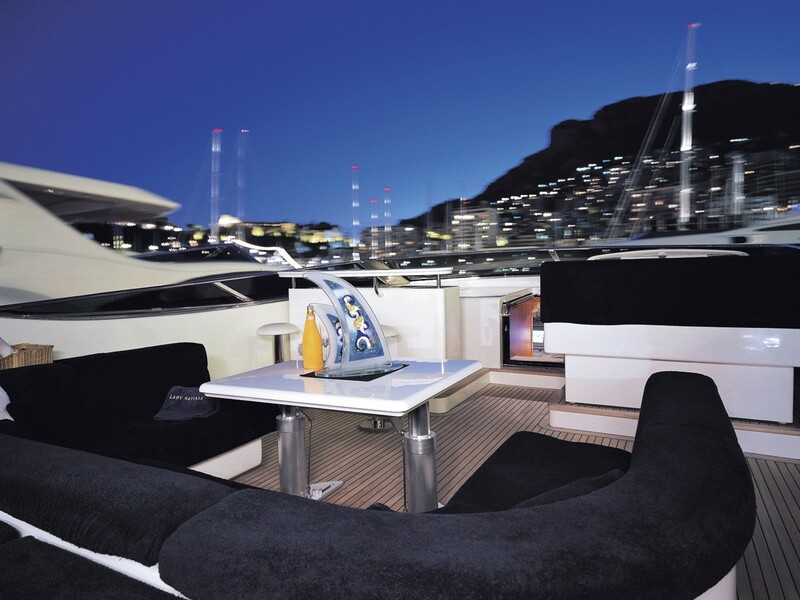 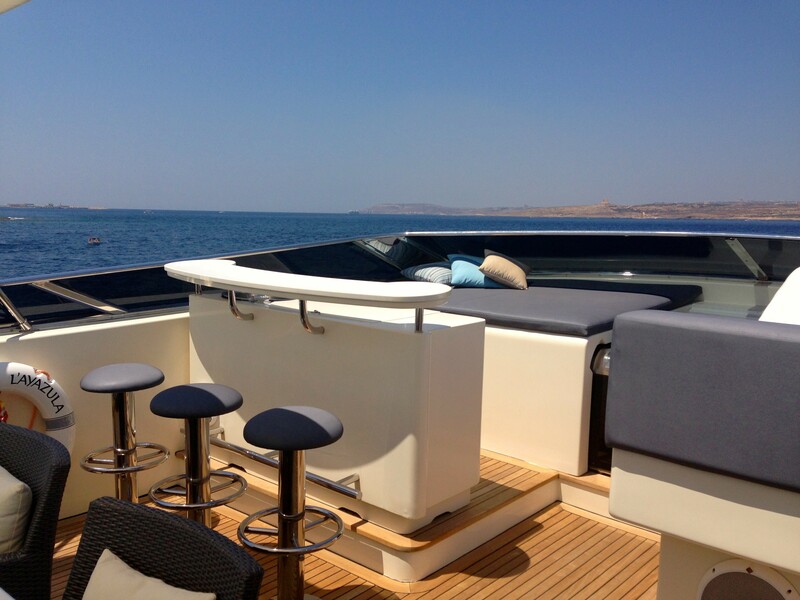 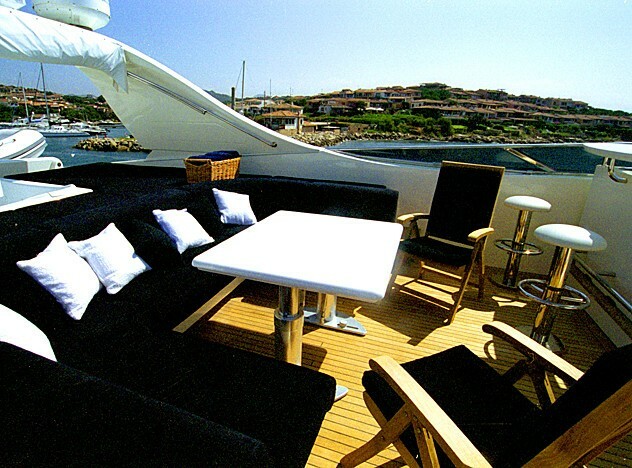 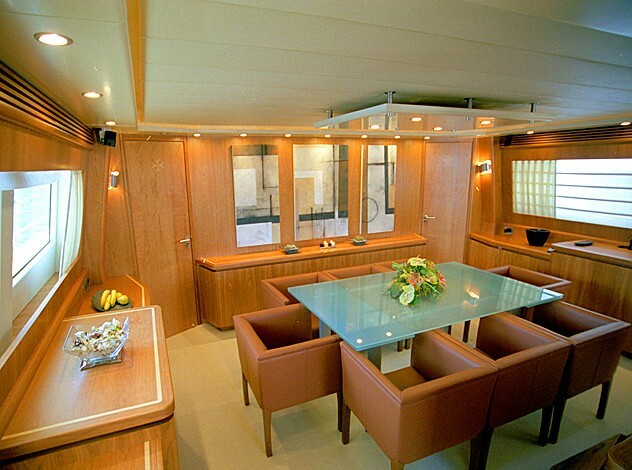 In additional to a spacious aft deck dining area for 8 guests, the sundeck offers additional dining and sun lounges. 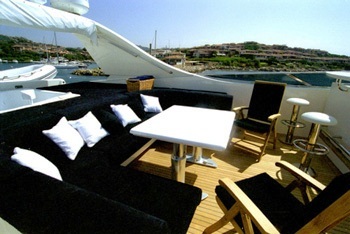 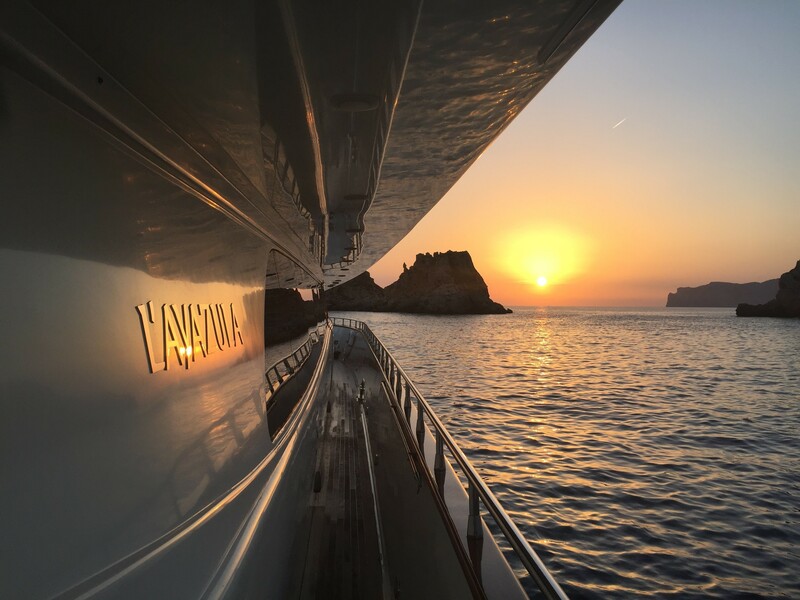 LAYAZULA cruises the Mediterranean and is available this season in the Western Mediterranean and Italy. 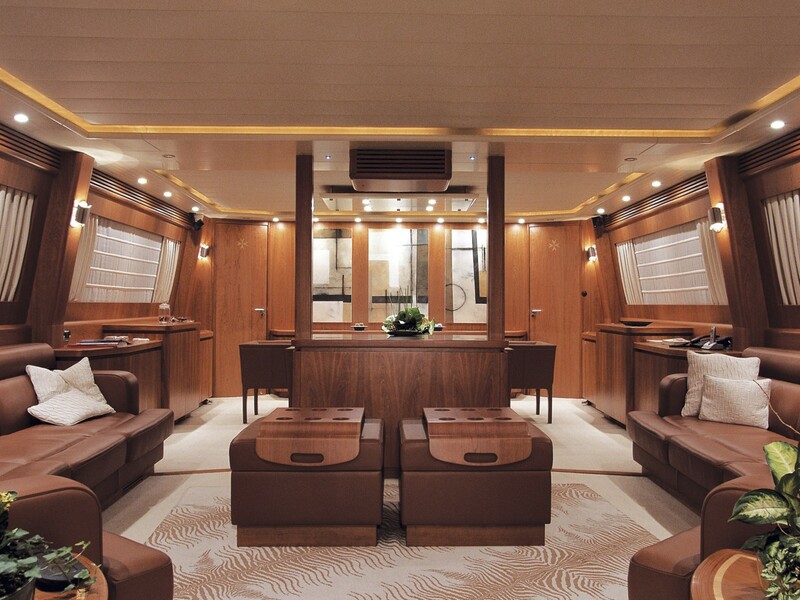 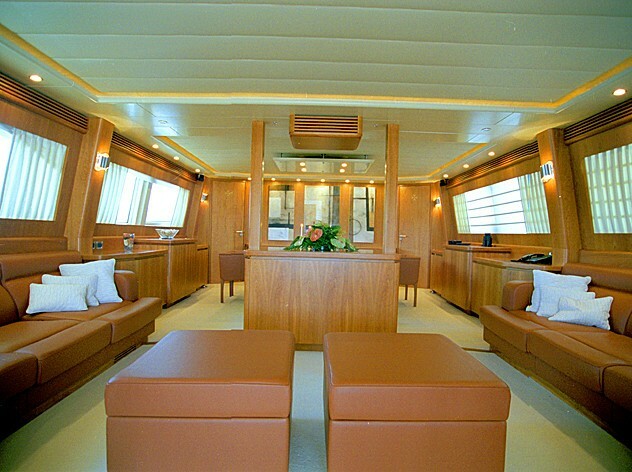 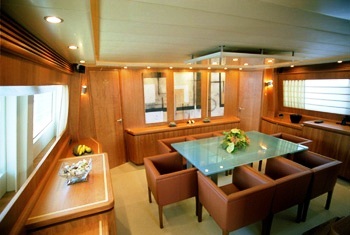 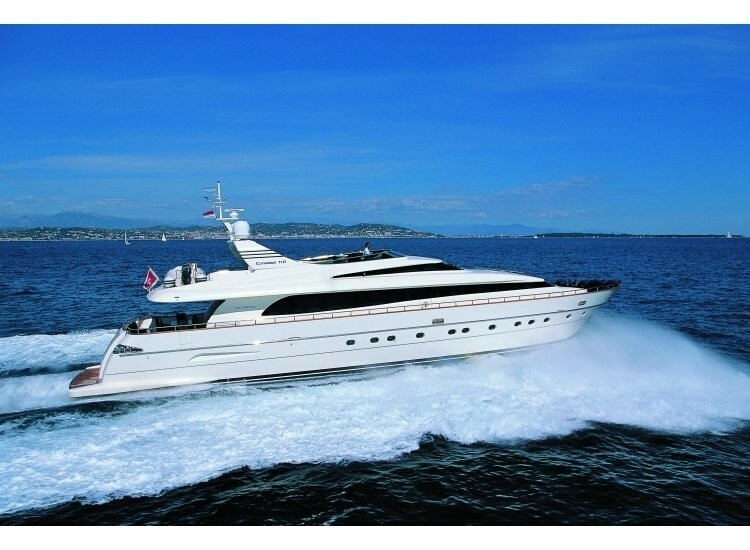 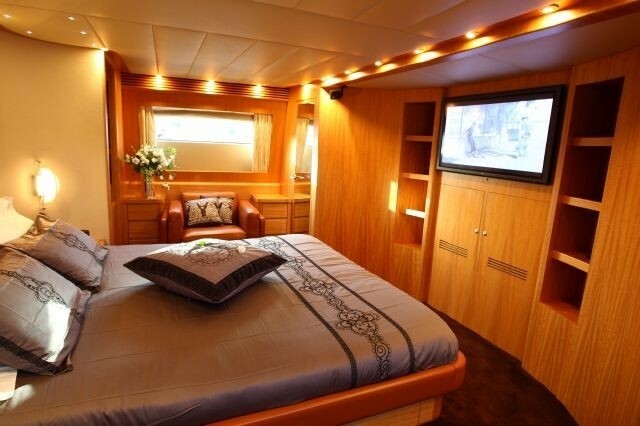 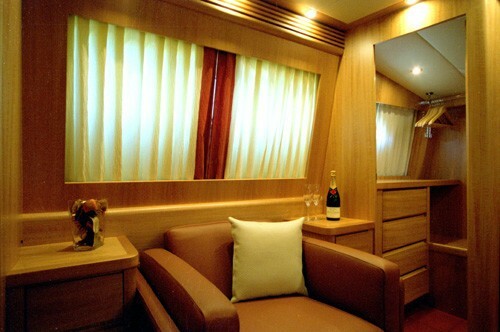 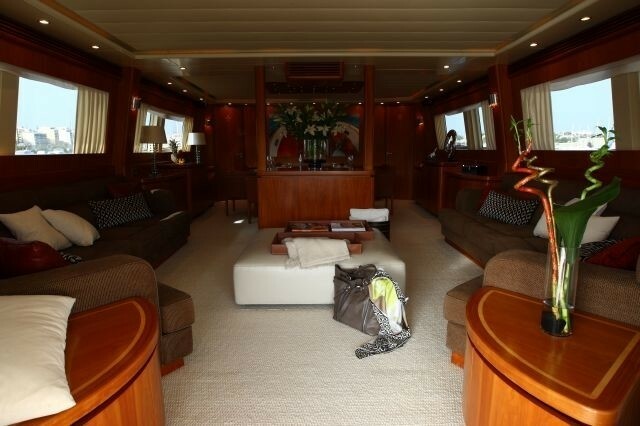 Motor Yacht LAYAZULA comfortably accommodates 10 guests in 4 stylish and elegant cabins. 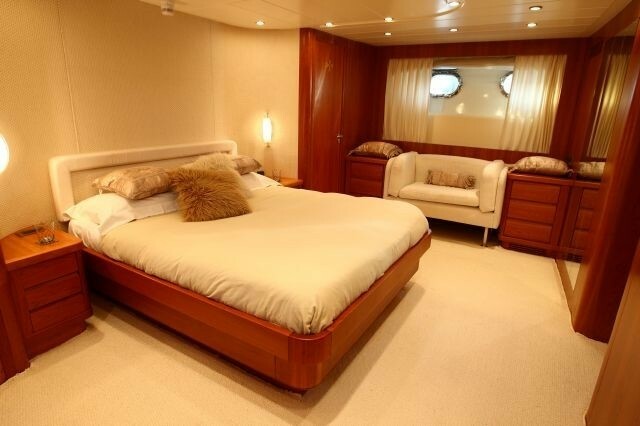 The Master Cabin is located forward on the main deck and boasts a large king sized bed and ensuite with spa pool tub/steam room. 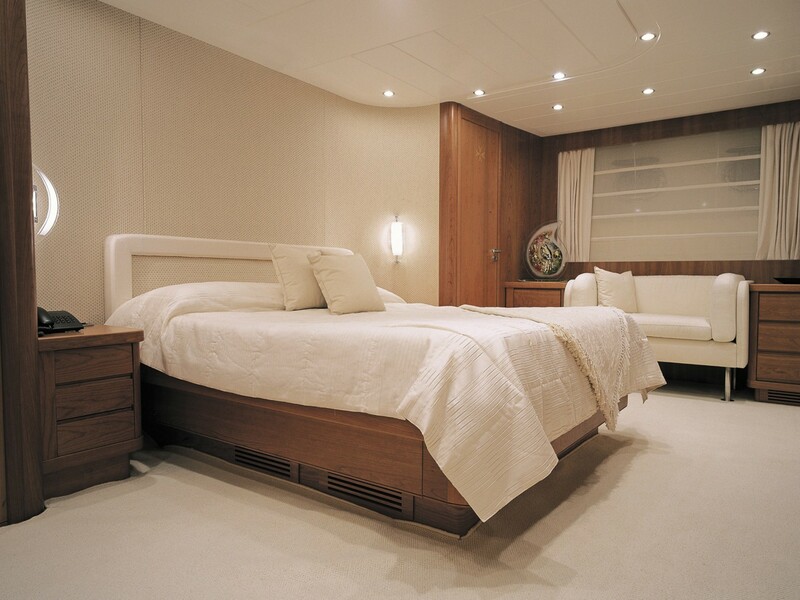 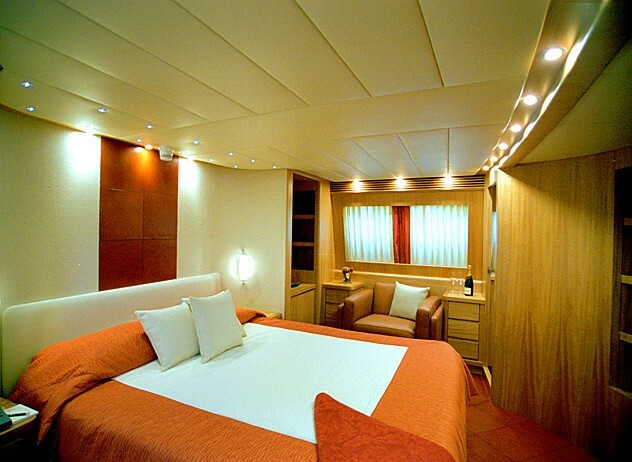 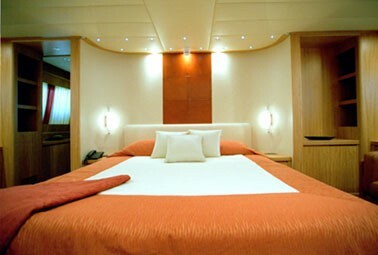 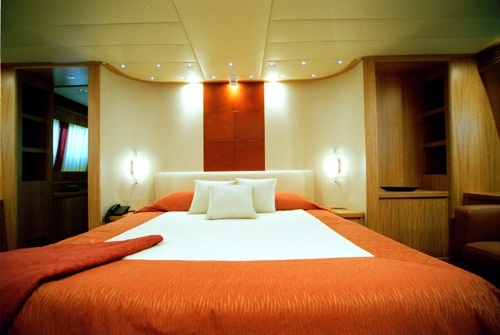 On the lower deck you’ll find the full beam width VIP cabin with en-suite bathroom and two identical twin cabins. 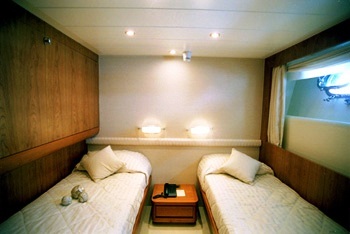 These twins conveniently convert to doubles if this is the preferred configuration. 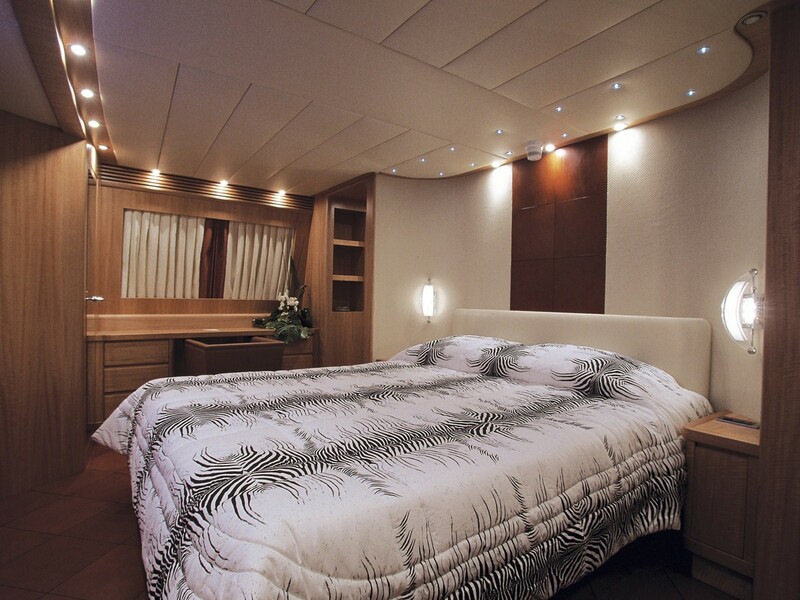 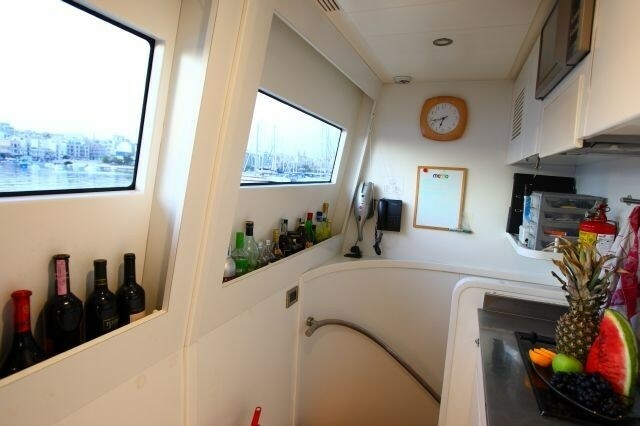 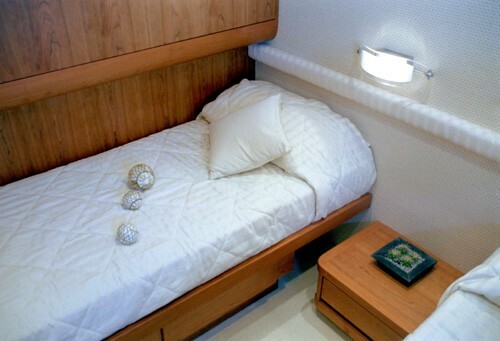 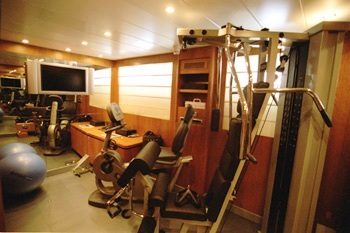 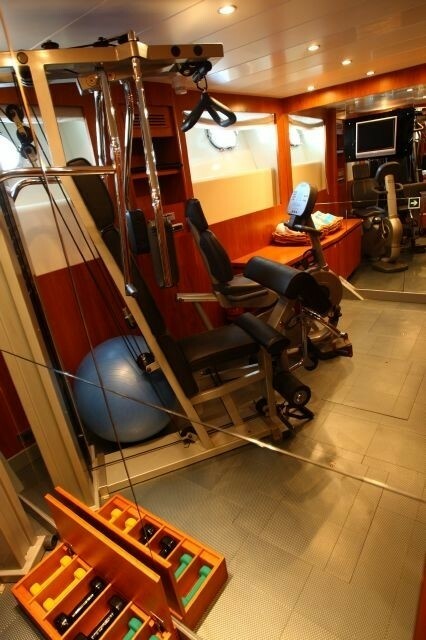 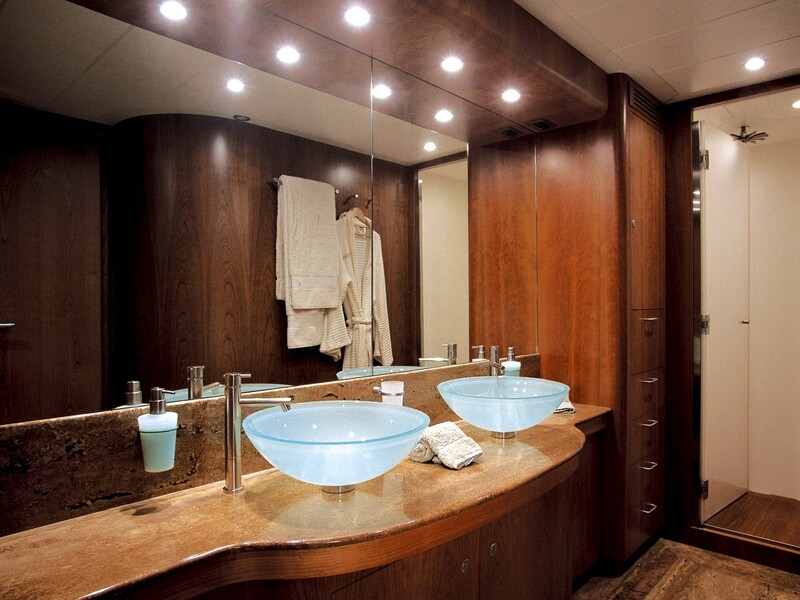 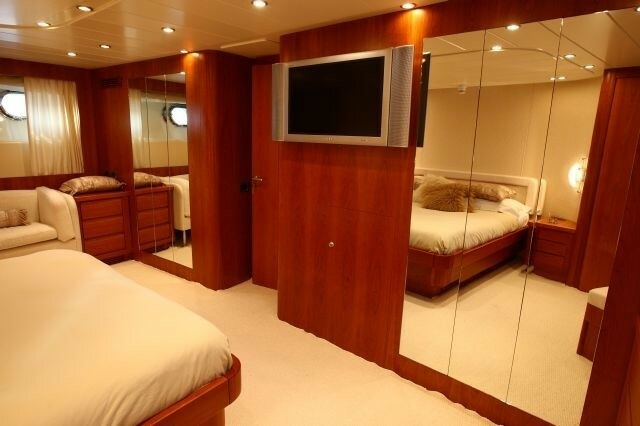 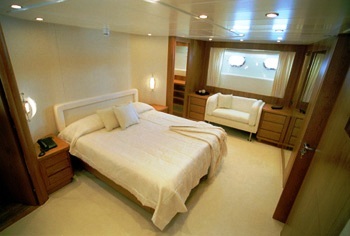 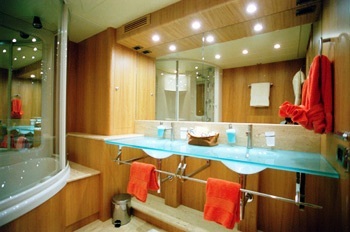 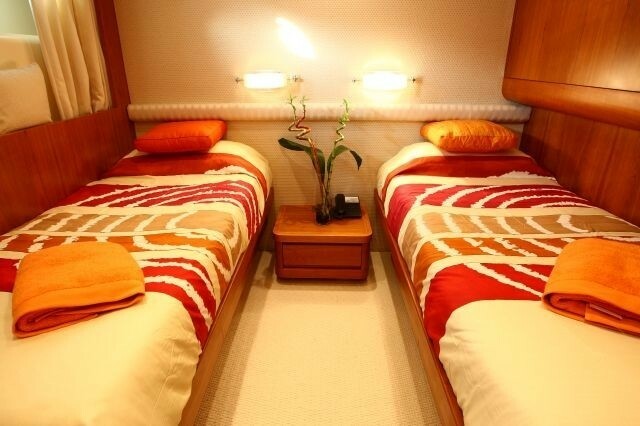 Each cabin on the luxury yacht LADY NATINIA has its own private ensuite. 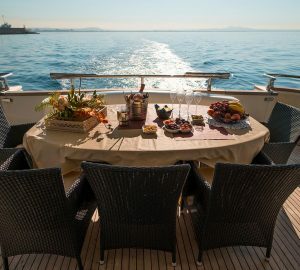 Luxury Yacht LAYAZULA (ex LADY NATINIA) is fully equipped with a range of entertainment facilities including: A spa pool on the flybridge, a gymnasium on lower deck, 1 x tender 4.6m Novamarine RIB inflatable with a 40hp outboard, 2 x Jet ski (two seater)Yamaha GP1300R, 2 x Donuts, Wakeboard, Water-skis, 2 complete diving set but no compressor, flippers, masks and snorkels. 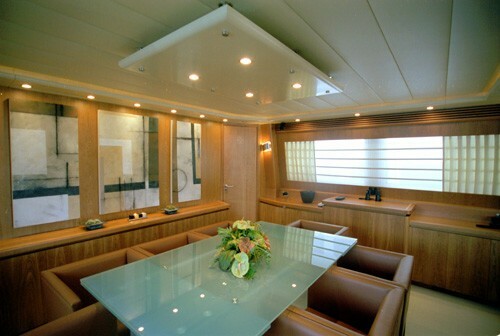 Audio visual equipment onboard LAYAZULA includes Plasma screen TVs and DVD’s in every cabin, Sky TV in the main saloon and master cabin. 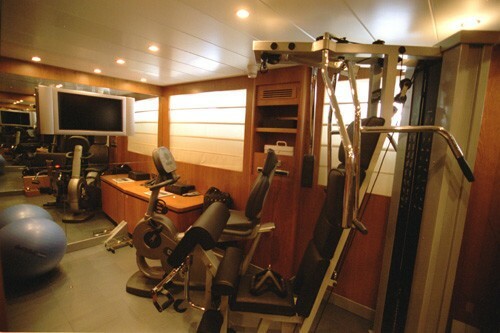 The communication facilities onboard include Satcom, GSM and WIFI connection when in port.